Photo: Wildfell, ca. 1854, Darlington, MD. 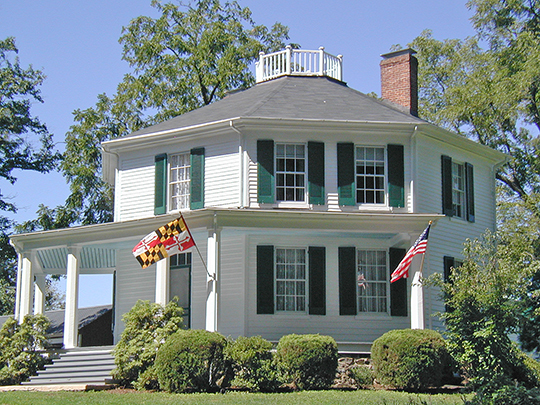 The home was commissioned by Baltimore's Joseph Jewett family and built by William Hensel. Listed on the National Register of Historic Places in 1973. Photographed by User:Matthew Payne (own work), 2004, [cc-by-3.0 (creativecommons.org/licenses/by/3.0)], via Wikimedia Commons, accessed January, 2014. Harford County Courthouse is located at 220 South Main Street, Bel Air MD 21014; phone: 410-638-3343. Harford county was formerly part of Baltimore county. After the removal of the county seat of the latter from Joppa (which is within the present limits of Harford) to Baltimore Town on the Patapsco, a petition for the formation of a new county was granted by the legislature of 1773. The proprietary of the province of Maryland at this time was Henry Harford, and from him the county took its name. The first county seat was Harford Town, or Bush, but as the settlements gradually extended farther and farther from the river and bay section, the people desired a more convenient location. As the result of an election in 1782, the county seat was removed to Bel Air, where it has remained. The physical features of the county being so varied, the industries are of many kinds. From the tidewater region in the southeastern part there is a gradual elevation, the highest point being 750 feet above the sea. In the spring much fishing is done along the Susquehanna and upper part of the Chesapeake. Sportsmen come from afar to take advantage of the duck-shooting here afforded. In the upper part of the county are found quarries of slate and limestone. Rolling fields of unsurpassed fertility give the tiller of the soil first place in the industries of the county. The pasture-land in the valley of the streams makes dairying profitable, and the canned goods industry has been encouraged to such an extent by the packers and brokers that Harford ranks among the first of all the southern counties in this respect. The facilities for shipping are good, the Baltimore and Ohio and the Philadelphia, Wilmington and Baltimore railroads traversing the entire southern part of the county, the Maryland and Pennsylvania running through a great portion of the central part in a north and south direction, while just across the river along the eastern border is the Columbia and Port Deposit road. The citizens of Harford have always taken an active part in both state and national history. As the first county seat lay on the main highway between Virginia and the Northern colonies, the ideas of Washington and Jefferson and Patrick Henry were easily disseminated. More than a year before Jefferson's famous instrument was adopted, thirty-four of Harford's representative sons, duly elected by the people of the county, signed a resolution in which they heartily approved of the " Resolves and Associations of the Continental Congress and the Resolves of the Provincial Convention," and solemnly pledged themselves to each other and to the country to perform the same at the risk of their lives and their fortunes. This is known as the famous Bush Declaration of March 22, 1775. In the courthouse at Bel Air are portraits of many of the distinguished citizens of the county who have left their impress upon the state and nation. Among them are found William Paca, signer of the Declaration of Independence and twice governor of the state ; Dr. John Archer, a member of the first Constitutional Convention of the state ; and Edwin Booth, one of the greatest of the world's actors. Abingdon, aptly termed the " Mecca of the Methodists," is noted as being the seat of the first Methodist College (Cokesbury) founded for higher education. Havre de Grace, named by Lafayette because of the resemblance of its location to that of the French Havre, is the largest town in the county, its population being 3,423. It figured in the War of 1812. Bel Air has a population of 961, and Aberdeen and other towns have from 100 to 800 inhabitants.